Yesterday I ran out to grab a few last minute ingredients for some appetizers I needed to make for a get-together. As I walked around the store with my oldest daughter, I figured while we were out we could also grab the things we needed for a child we had adopted for the Christmas holiday. I wanted her to get to pick out what our little boy would receive. The store was packed, and so many items were moved around, I went up to ask an employee where we could find the boys gloves. So I said "Excuse me".....maybe three times...until he looked up and motioned toward his ear. So I signed, "Are you deaf?". He nodded. I signed, "Do you use sign?". His face lit up and signed, "Yes", he did. So I put my coffee down in the cart, and we had a great conversation, in ASL (American Sign Language). He was able to tell me where to find what I needed. He had such a look of pride on his face from being to help me in his own language, it made me have tears in my eyes. As we walked away to go find those gloves, I turned to my daughter, who is in 6th grade, and said, "THAT is why you take Sign Language as your language at school as soon as you can". She is lucky that schools in our district offer American Sign Language as a language choice, and she can take it next semester. Of course, I'm biased, I think it's a beautiful language after studying it myself for a couple years, and immersing myself in Deaf Culture. It's a completely different world, hidden in plain sight. I have seen that employee before, but I had no idea he was deaf. I wrote about a similar experience HERE. I thought the teachable moment of that shopping trip was going to be having Taylor pick out the gifts for the child we adopted....but turns out there was a lot more to learn from that employee. He told me he usually works in the back, stocking items, since he is deaf. He doesn't have to be around people who can't communicate with him that way. Another reason why I was so glad we met him~ not like I did him a favor my chatting with him, but our conversation made him feel valued. He was able to direct me to what I needed without writing a note or trying to force his voice to talk to make me feel comfortable. He could just be himself, and said he was so happy to help us, and I believe he really meant it. When we gathered up the winter coat/hat/gloves we needed, he popped up making sure we found what we were looking for, and we chatted some more. 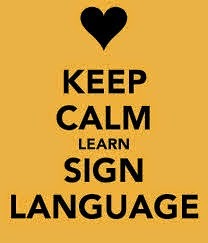 If your child has the opportunity to learn Sign Language, encourage them to do it! So many more schools are offering it as a language choice, and if you're worried that it won't serve them in life, think again. I can't tell you how many times I have been able to use it in different situations, and it's a life skill that's worth it. Imagine going through life, even just your workday, where maybe 90% of your co-workers are chatting and interacting, and you are on the outside looking in. I can't imagine how polarizing that could be. Even if learning the basics just teaches empathy when they encounter a deaf person, it would be worth it. He told me stories of people being rude when they couldn't understand him~ giving him a mean face, throwing their hands up and walking away. A little understanding can go a long way, and they might just be able to make someone's day. In my life before children, I was a special education teacher, a position I felt was more of a vocation than a job. Since having children, being a full time mom has led me to learn how to knit, sew, quilt, and find ways to be creative. I recently became a Level 2 Reiki practitioner. I have a skincare business with Rodan+Fields, and I'm building an amazing team of women from all over the country. Working with the doctors who created Proactiv has been an amazing opportunity. My world revolves around trying to guide my daughters to be kind, and find ways to pay it forward. Hopefully this will be a place for that as well!